Whether you've lost a large amount of weight, recently had a baby or you're just getting older, loose, sagging skin can crop up around your belly, arms, thighs or face. Loose body skin may be a sign of poor muscle tone, in which case you'll need to build those underdeveloped muscles to create a toned, firm appearance. Sometimes, the elasticity of the skin just isn't what it used to be, and firming creams coupled with supplements can help. If your skin is too loose to benefit from these treatments, a physician can advise you about further treatment. Drink at least eight 8-ounce glasses of pure water every day. Even mild dehydration can have adverse effects on the texture of your skin. On your face, dark circles may be more prominent, fine lines can look deeper and your facial tone can look saggy and drawn. 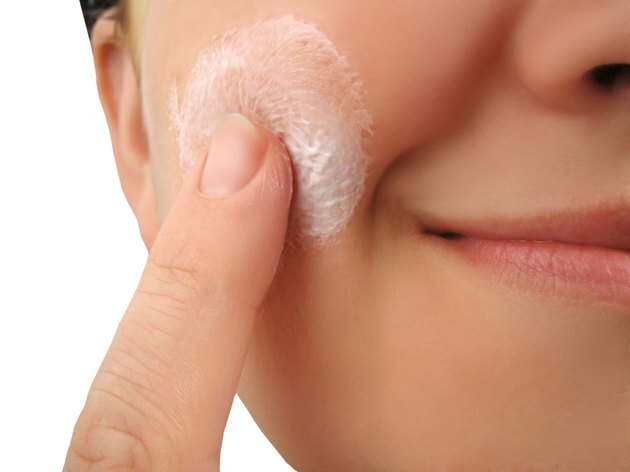 Pat on a moisturizer to plump skin temporarily and give the appearance of a firmer surface on your face and body. A lotion with caffeine as an ingredient can help firm the skin by constricting blood vessels slightly. Smooth on a vitamin A cream, vitamin C cream or a cream with alpha- or beta-hydroxy acids to loose facial and body skin in the evening. These active ingredients can help improve the look of skin by speeding up cell turnover and renewal to create new, firmer skin cells. Incorporate strength-training exercises into your workout to help build muscle underneath poorly toned body skin. For example, if you notice saggy skin on your upper arms, weight lifting can help build the triceps and biceps beneath the skin to give your arms a more toned appearance. This is especially helpful for people who have lost weight through diet and cardio but haven't focused on strength exercises. Use weights heavy enough to wear you out after just eight to 12 repetitions. Repeat two to three times a week. Take a gelatin or combination borage-seed and fish-oil supplement daily. These oral treatments have been shown to increase skin elasticity over a period of eight weeks. Take no more than indicated on the supplement's instructions. Talk to a licensed dermatologist for stubborn sagging skin that doesn't respond to topical treatments, oral treatments or muscle-building exercise. Your doctor may recommend infrared or laser treatments to firm skin. Very loose skin may require a more invasive lift procedure. Apply sunscreen of at least SPF 15 to all exposed areas, as sun damage will weaken the elasticity of your skin even further. Choose a moisturizer with SPF included to save yourself the hassle of applying two products. Couple your workout with low-fat, high-protein foods such as lean meat, chicken, fish or nuts and seeds to help you build muscle without gaining fat. If any topical treatment produces burning, stinging or itching, rinse immediately with cool water and discontinue use. Consult with a physician before you begin a workout regimen, especially if you've faced illness or injury in the past.